Last minute cancellations are the worst—only second to no-shows. A quick fix for both? Send out appointment reminders. Pretend you’re an HVAC business owner for a moment. You book a new client for an air conditioner install, order the air conditioner, prep your employee with the appropriate job details, they pack up the right equipment, drive to the client’s home, knock on the door, and…nothing. The client isn’t home. When you get ahold of them they still want their new air conditioner installed, they just forgot about the appointment and want to know when they can rebook. Problem is, summer is here, and it’s hot, and you’re booked up for 2 straight weeks. Now no one is happy. Does this nightmare sound all too real? No matter what industry your service business falls into, there is always a chance you’ll be dealing with last minute cancellations and no-shows. Sometimes it’s carelessness on a customer’s part, and sometimes life just gets in the way. They wanted to pay you for your services. They would have paid you if they remembered where they needed to be. They won’t be a happy returning customer if you can’t shuffle things around on your end to accommodate them. A simple appointment reminder can help you avoid these irritating situations, and we’ve got templates for the top three reminder strategies. When to send them? You know your business best, so you know if one week or one day gives you enough notice to fill in an empty slot if your client needs to reschedule. Giving your clients a call to confirm an appointment is great because if they pick up you have verbal confirmation that they are ready to proceed with a job. However, what if you have to leave a voicemail or there’s no answer and no voicemail? In those cases, tacking on one of the other reminder strategies might be a good idea. This is [your name] calling from [business name] to remind you of your upcoming [service description] on [day, month, number] at [time]. Can you please confirm that you’d like to go ahead with this appointment [voicemail addition: by calling [phone number] by [date and time]? Specify who’s calling, the service, the service date and time, how to get in touch, and when to get in touch by. If you have a cancellation policy in place include those details briefly as well. If you’re looking for more guidance on the phone, check out our article on phone etiquette. Text reminders are more and more common, and nice for your customers because they can check them on their own time (versus an interruptive phone call). From your perspective, you can rest easier knowing that most people have their phones in their pockets all day with notifications popping up on their homescreens, so the chances of a text being missed are low. This is an automated reminder from [business name] about our upcoming appointment at [time] on [month, date]. Please call us at [phone number] if you have any questions. In Jobber, an ‘ok’ shows up as a confirmation on individual jobs, and any other response will prompt your client to get in touch with your business to rebook. 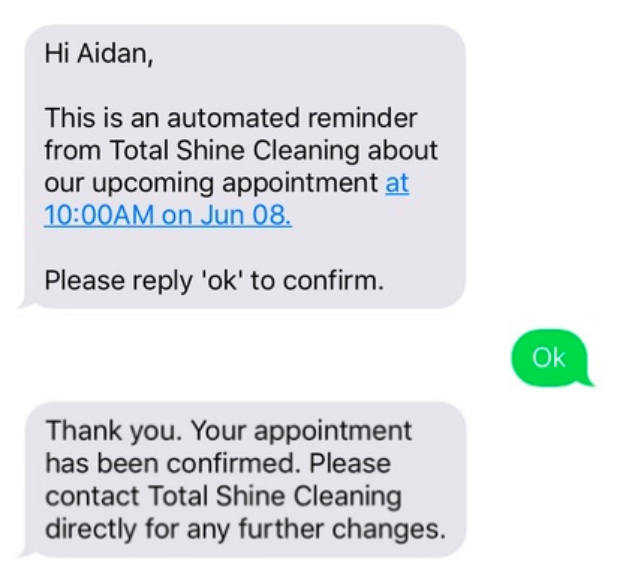 If you’re sending these texts manually you can ask for an ‘ok’ text or rest easy knowing that your client will likely get in touch if things aren’t ok.
Email reminders are another common way to get in touch with customers before an appointment. They’re both easy for you to deploy, and easy for a customer to pull up for a second look. Just a friendly reminder that we have an upcoming appointment. If you have any questions or concerns, please don’t hesitate to get in touch with us at [email address]. Of course, if you’re not using Jobber you can remove the call to click the link and still be satisfied with giving them the option to call in if they need to rebook, or ask them to respond to the email with a confirmation. While we’re talking emails, what does your signature look like? Polish it up with these tips. You can call, text, and email and you’ll still run into the occasional last minute cancellation or no-show, but appointment reminders will help ensure those occurrences are few and far between. Automating these reminders with software like Jobber does even better for your business’ bottom line. Rather than paying your employees to call customers and draft emails, Jobber allows you to set-and-forget automatic text and email reminders. That means emails and texts go out when you specify (a week, a day, an hour ahead of time) no matter how busy your day gets. Bonus: Jobber records customer confirmations so that you have a leg to stand on when it comes to enforcing a cancellation policy.